a few scribbles in the sketchbooks. the small moleskine is absolutely fabulous for car sketching which i haven’t been doing enough of lately. the study below was for an OMG demo. i must remember to do a rough sketch in red ink and then paint over it with gouache again. i do love that bright color peeking through. i’m resuming my car sketching habits that i’ve let fall by the wayside. also want to sit on some benches while i’m tromping through LA’s public gardens and get back in the groove of making live little paintings. will update you as to the palette i’ll be using for this soon. Your art makes me smile. I taught in a SpEd classroom one year. We had a young girl, Mary, obsessed with time. She’d announce, “teacher, time for 2nd grade retheeth” “teacher, time for Thamuel to go to thpeech” “teacher, muthic is coming” It was really quite charming and annoying at the same time. Actually, I have the very same issue going on in my art corner. I’m loving the book I made for Oh My Gouache with real watercolor paper. Who knew having the right paper would make such a difference? It’s all I want to play in. But I have three other books in rotation. Trying not to stress. There’s always magic flitting around your little corner of the big marble. bTW I also checked Roget’s and nothing there either. i am at this moment drumming my fingers on the desk thinking of a solution to your dreadful quandary. i will send a telegram when i have devised a solution! I’ll meet you at the third bench on the left side of the path immediately past the crooked tree with the big pine cones on Saturday morning. 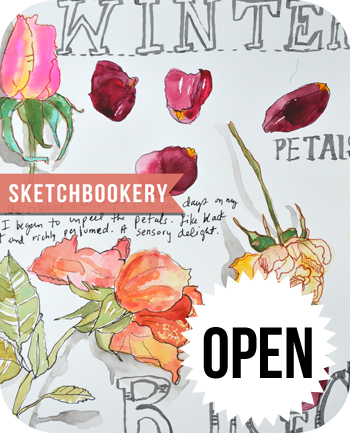 You bring your sketch books that need finished and I will bring mine. We won’t leave until we are done! Lovely artwork Mary Ann, and I agree on sketching more with the red ink. It looks amazing! I just got over the creeping crud, so kind of in a mind muddle. I too am watching Victoria. I love history! I have been involved in planning my middle child’s wedding, which is coming up fast and is freaking me out! I love the little Moleskines. I have one that I use for just experimenting and another that is a completed mini-collage book. Sometimes working in a small format is less intimdating. 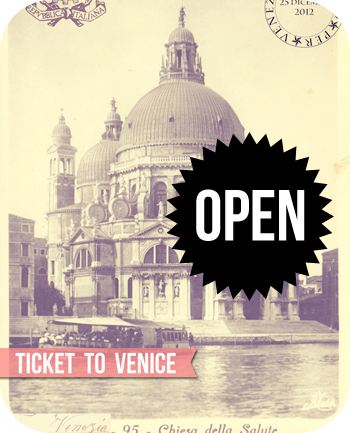 Good news: I finally finished my London journal, the one I started last spring when I took Ticket to Venice. I’ll post the results on flickr and Facebook.